What is the role of nucleus in protein synthesis? Ans: The information of DNA of nucleus is transcribed into RNA. This RNA is used in the synthesis of proteins by translation. These proteins in the form of enzymes and other proteins determine the specific activities of the cells. What are perinuclear space and nuclear lamina? Ans: The nuclear envelope is composed of double membrane. The two membranes are separated by a space called perinuclear space. It is about 20 to 40nm. A layer of protein is present closely associated with the nuclear side of the inner membrane. It is called nuclear lamina. 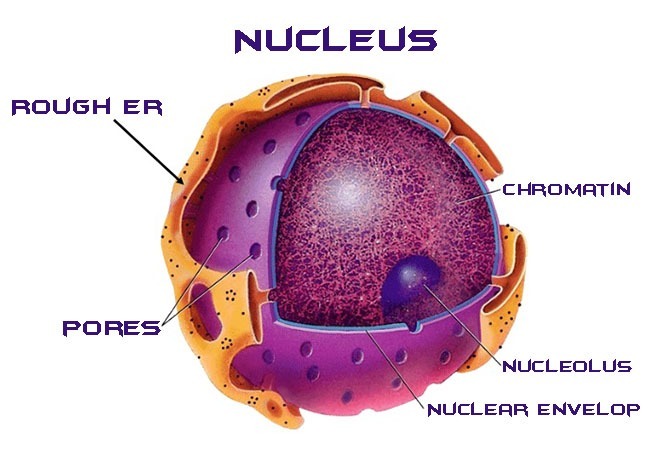 What is nucleolus? Give their function? Ans: Nucleoli are present at nucleolar organizers. These are specialized regions of some chromosomes. They contain multiple copies of genes for ribosome synthesis. Ribosomes are present in various stages of production. Ans: The chromosomes are thread like during interphase. So, they cannot be identified as individual structures. Thus, the chromosomes are appeared as mass of stained material. This stained material is collectively called as chromatin. What are the components of chromosome? Ans: A chromosome is made of telomere, chromatids, centromere, primary constriction and a secondary constriction. What is telomere? Give its function? Ans: A telomere caps each end of every chromosome. Specific proteins bind to telomere. These proteins protect chromosomes from the attacks of exonucleases present in the same cell. Telomere permits DNA replication to continue to the very end of the chromosome. What is the structure of telomeric DNA? Ans: The structure of telomeric DNA is very similar in all eukaryotic organisms. One strand of the DNA is rich in guanine. It is oriented toward the end of the chromosome. The other strand is rich in cytosine. It is oriented toward the centromere. In most organisms, the telomere consists of multiple copies of a very short DNA. What is centromere? Give its structure? Ans: One or more pairs of chromosomes in each species have also secondary constriction. It does not stain well. Nucleolus is attached with this region. This region contains multiple copies of the genes that transcribe the ribosomal RNA (rRNA) within the nucleolus. Ans: Four types of Histone protein form a core particle called nucleosome. These proteins are H2A, H2B, H3, H4. The nucleosome is composed of eight molecules of histones. DNA coil around the nucleosome. What is linker DNA? Give its function? Ans: The fifth histone H1 is called the linker protein. It is not needed to form the nucleosome. Rather it fixes the DNA with nucleosomes. Ans: The beaded string undergoes higher order packing. The chromatin coils and folds further to produce the thickened, compact chromosomes during mitosis. The beaded string can coil tightly with the help of histone H1. It makes a cylinder 30 nm in diameter. It is called solenoid. Ans: The solenoid fiber forms loops called loop domains. Differentiate between Heterochromatic and euchromatin regions? Ans: Heterochromatic regions are inactive portions of chromosomes. They show a banding pattern with certain stains. So, they are called heterochromatin. The DNA of heterochromatin is not transcribed. The active portions of chromosomes are called euchromatic regions. What are karyotype and karyology? Ans: A karyotype is the complete set of all chromosomes of a cell of any living organism. The study of karyotypes is known as karyology. What is Spectral karyotype (SKY technique)? Ans: Spectral karyotyping is a molecular cytogenetic technique. It is used to visualize all the 23 pairs of human (or the 20 pairs of mouse) chromosomes in different colors. This technique is widely used to identify structural chromosome aberrations in cancer cells and other disease conditions. Ans: Colchicine is a drug which prevents cutokinesis.